ISHARA S. KODIKARA/AFP/Getty ImagesA Sri Lankan man holds up a message on Twitter showing that Facebook had been banned in Colombo on March 7, 2018. The Sri Lankan government has banned the use of Facebook, Instagram, and WhatsApp. 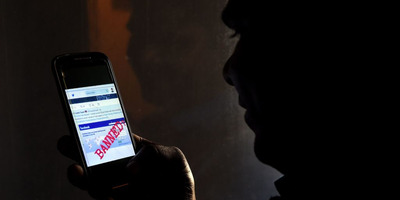 The government asked internet service providers to block messaging apps after the discovery of Facebook posts encouraging violence towards the country’s Muslim population. The ban follows a 10-day nationwide state of emergency after violence erupted between Muslim and Buddhist communities. Senaratne said in a press conference Wednesday that officials have been investigating who is fuelling calls for riots and that several parliamentary officials had been mentioned. After a state of emergency was declared on Tuesday, curfews were instated in the central district of Kandy, a popular tourist destination that was the epicentre of Sunday clashes between the Buddhist Sinhalese majority and local Muslims, who make up about nine per cent of Sri Lanka’s population.